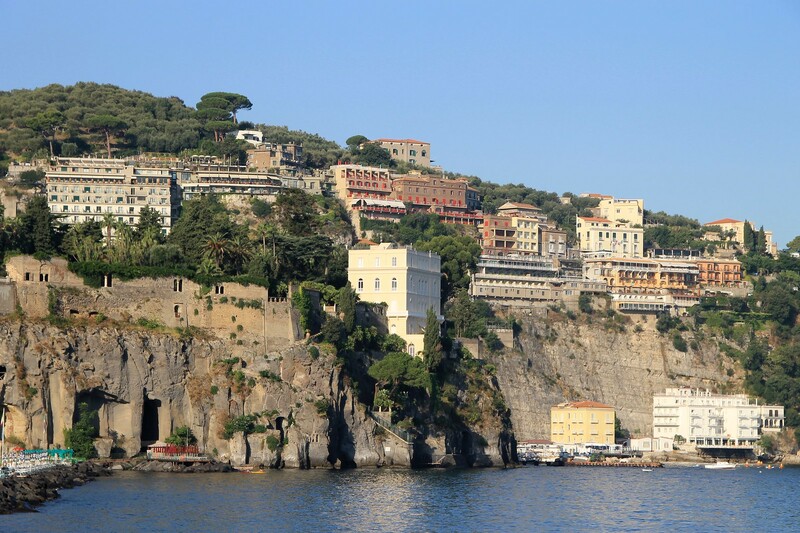 Heading across to the towns and islands of Positano, Capri and Amalfi was easy and convenient from our base in Sorrento. There are several day-cruise companies offering their services to take you there for a cost down at the harbour. It's worth shopping around to see which one will offer you the best deal. They tend to leave at several points in the day, but to make the most of your visit I'd recommend getting on an early morning cruise. We boarded one which left around 9:30am, by which point the sun was already intense in the sky. 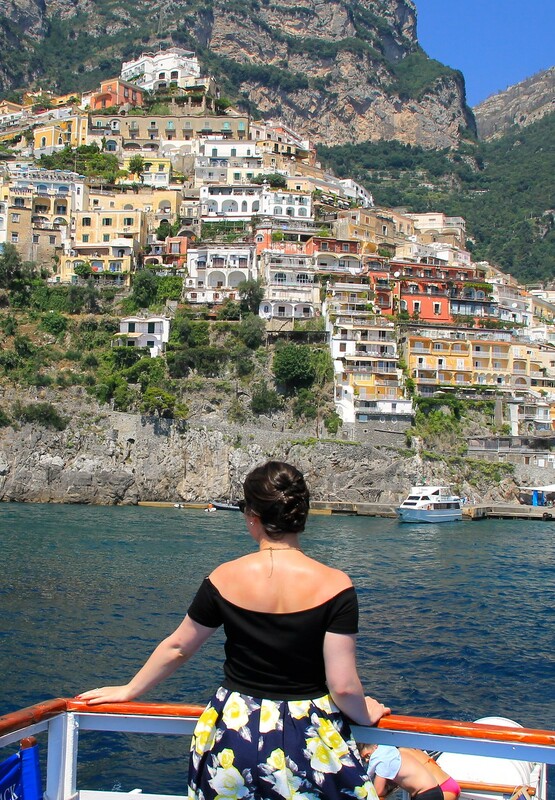 Positano was the place I had longed to see the most in our whole trip. 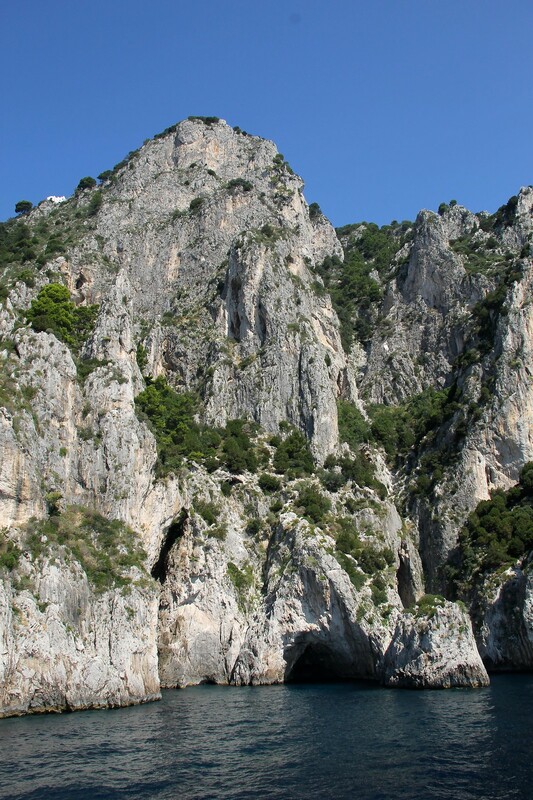 I can't lie, I was excited about this, the boat trip was easily one of the highlights of our travels, the Amalfi Coast really is genuinely so beautiful, it feels a bit surreal when you are there. The second we turned the corner and I saw the colourful buildings and houses built up on top of each other so high along the cliff, I knew that we had arrived. You could pay to get off and dock at Positano and be picked up three hours later when the cruise made it's way back, but we decided against it as it meant that we would miss out on seeing the other places along the coast line, and stopping at Amalfi as our final destination which was further round. It was great being able to see all the towns from such a unique location on the water instead of up on the hill tops. If you're a bit shaky not the water there are several other companies that offer an air conditioned bus route, but you're pretty high up and don't get quite the same view. Not to mention going across that thin crumbling mountain road! 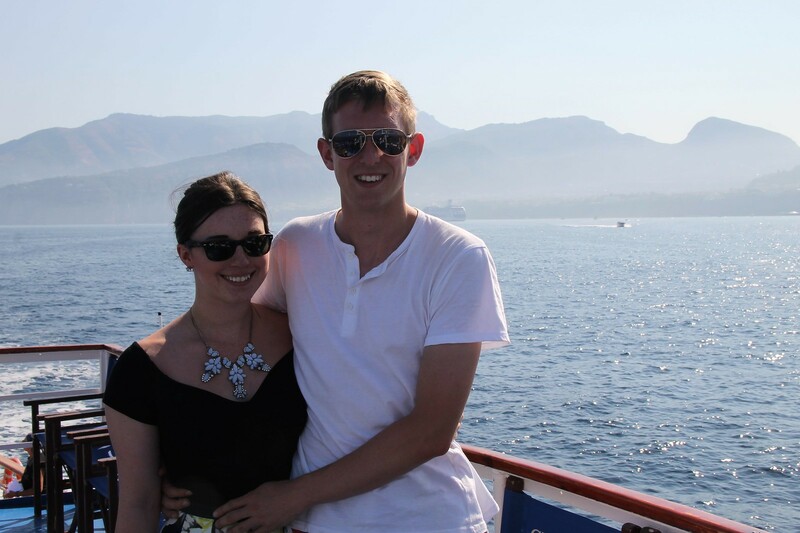 There's nothing like being on the sea with the breeze in your face, I really can't recommend going by boat enough. 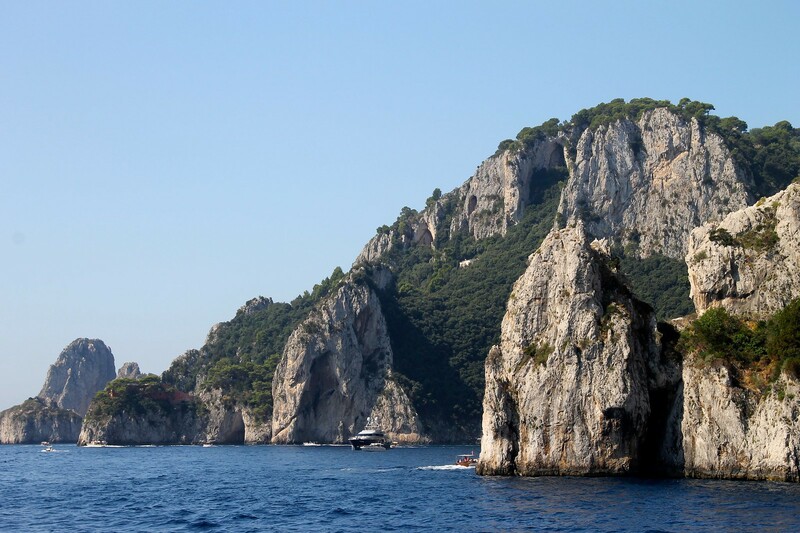 With Roman ruins and rugged landscapes, Capri has been the go to destination for Hollywood stars for centuries. 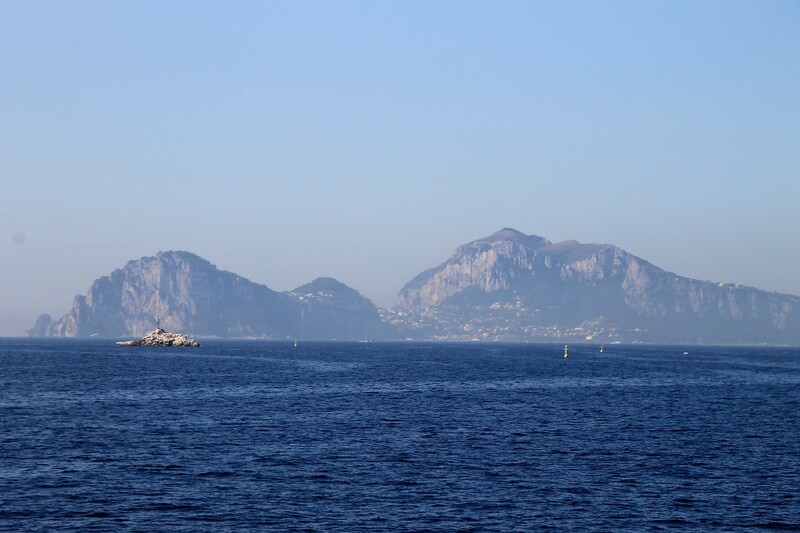 A popular summer destination for VIP's, Capri isn't cheap by any means, and is full of expensive restaurants and luxury shopping. As beautiful as it is, you might find yourself there purely for the views, for the very reason we didn't stop off and head onto the island there. 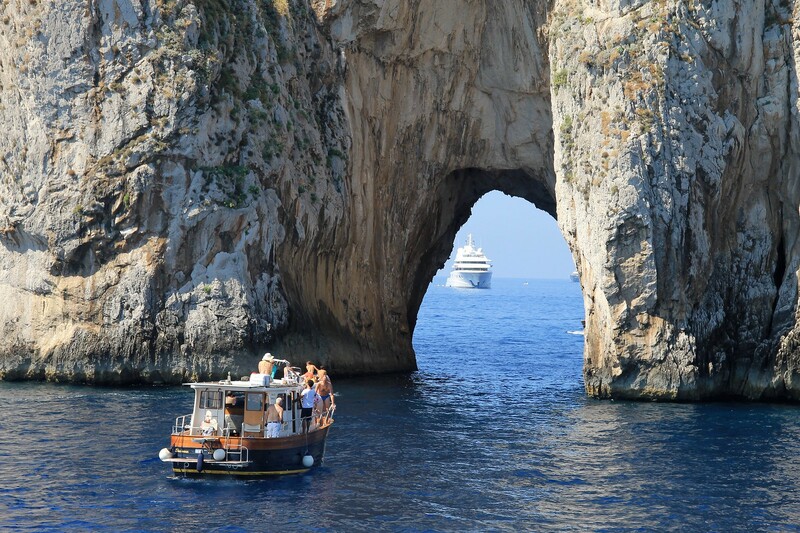 Instead take a dip off the boat cruise into the serene blue ocean below with surrounding hidden grottos and cool off from the summer heat. 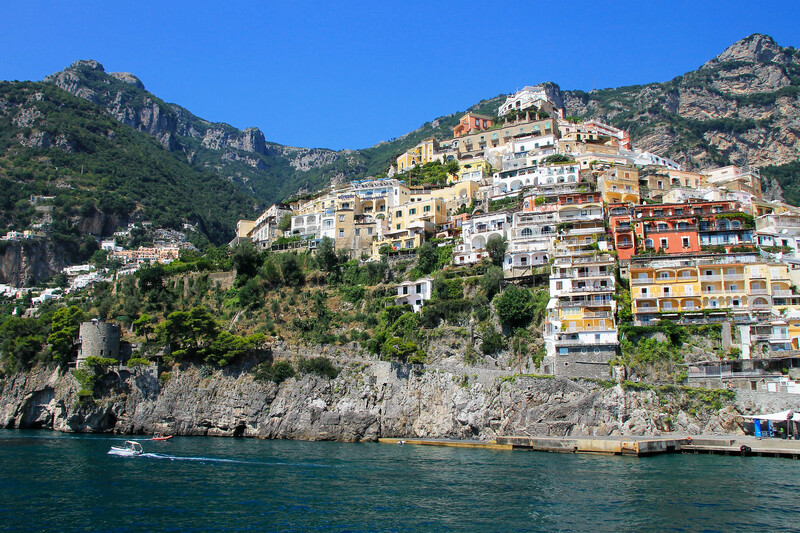 Take in the surrounding views as you approach Positano around the corner, with the pastel hillside houses in sight. You'll be surrounded by mega yachts from the rich and famous, a view to be had in itself. 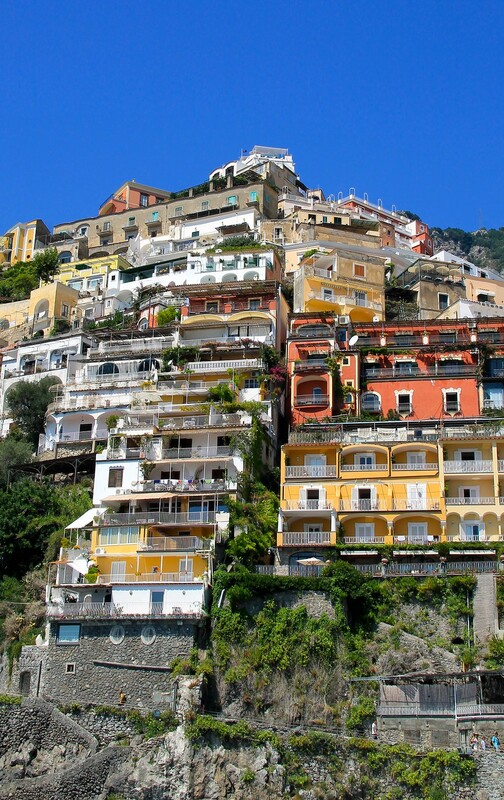 One of the most photographed towns in the world, Positano is truly beautiful. With houses cascading down the hillside towards the sea, in different shades of pastels, it's hard to miss. Be sure to take appropriate shoes to tackle Positano's steep incline streets lined with wisteria. Arguably one of the most breathtaking places for a sunset, book yourself into a cliffside restaurant over watching the sea to witness one of the Amalfi Coasts most breathtaking sunsets. Amalfi which once was a bustling city with over 70,000 residents, sadly a lot of it has now sadly crumbled into the sea following an earthquake in 1343. Leaving it considerably smaller, you're able to walk end to end in 20 minutes. Still very picturesque with sun filled piazzas and ice cold gelato stores as pop ups down the white washed alley side streets, it's still somewhere worth visiting. 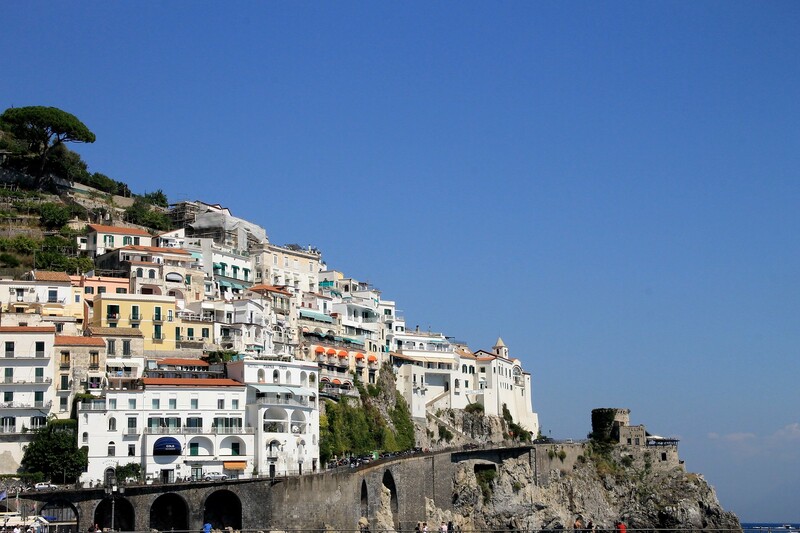 Visit Amalfi's Cathedral, in the Piazza del Duomo. Somewhere well worth paying a small fee to enter inside, the cathedral is truly beautiful. Perch yourself for some relaxation on the beach whilst you wait for the tour boat to re-enter the harbour. It was everything I had imagined it to be and more, the entire day was just so relaxing and breathtaking, it was really just what we needed after the madness of all our travelling and walking the entire trip. The photographs really don't do it justice. Don't forget to wear your swimming costume under your clothes for a dip in the ocean, and something dry to change back into. Do shop around for the best deals on boat or by bus, it's very competitive. If you buy anything from the various stop off points try your hand at bargaining to see if you can get a better deal, the streets further into the markets are always cheaper. 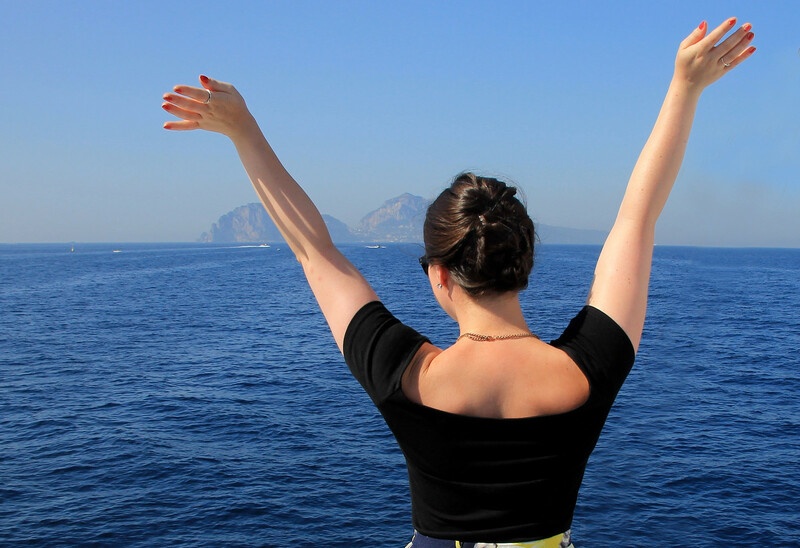 Do enjoy some wonderful authentic Italian food by the sea, the cruises are a few hours long and you will get hungry. Don't forget your camera, I can't stress how breathtakingly beautiful it all was enough. I hope you enjoyed my travel series on Italy, you can see more of what I got up to on my travels around Italy - here. And don't forget to check out my vlog of our trip below!